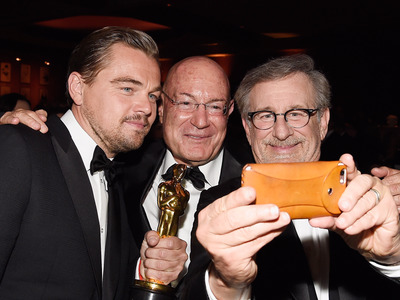 Kevork Djansezian/GettyLeonardo DiCaprio, Arnon Milchan and Steven Spielberg. Despite the commercial and critical success of his recent blockbuster films like “The Revenant” and “The Big Short,” Hollywood producer Arnon Milchan suggests that the movie business is far from a flourishing industry. Though “The Revenant” went on to garner 12 Oscar nominations, three Oscar wins, and an impressive $533 million in global box-office revenue, the film was initially the subject of much scepticism prior to its release, as its budget repeatedly skyrocketed in production. In the profile, Milchan uses “The Revenant” to illustrate the financial difficulties of producing a major film. He describes how the $140 million budget behind the “The Revenant” came almost entirely from his own “personal bank account” — and that doesn’t even include the various auxiliary costs that go into distribution. Despite his bleak depiction of the film industry at large, Milchan remains optimistic about his own prospects — and for good reason, as he and New Recency have financed the past three Oscar Best Picture winners (“The Revenant,” “Birdman,” and “12 Years a Slave”).